I have the knack to be at the wrong place at the wrong time! It is enough to capture public imagination & people focus lens! Why such a lot of criticism & negative attention in my share? I am wrongly accused for what I haven't done & news wild! From my track-record, it seems I am controversy's favorite child! The narcissistic in me continues to believe I'm an Angel cool! "Fools rush in where Angels fear to tread" - I am such a fool! My hard-work & sincerity should have gifted me what I deserve! 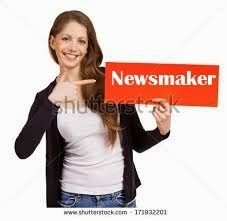 Being a Newsmaker for the right reasons is what I would love! People like me shall have only credit in their fate & no pain, only gain! Linking it to Two Shoes Tuesday #92 - Drift Or Date. This is my 1st submission for this prompt. Thanks to Patricia. I love the way you weave a story into a poem with rhymes. I only know the word "Story-Poem' because of you! Thank you so much, Soumya! Your words mean a lot! Story poem is new to me, thanks for your recent visit and comment on my photo blog, now your latest follower. An aesthetic write up and so true about life plus this hypocrite world. Thanks Vishal. What a world we belong to! story into poem .. that quite beautiful !